Skill shortage or not – all of the domestic indicators appear to be telling us there’s a shortage of qualified pilots (hours not basic qualification), flight instructors (qualifications B cat and above) and avionics engineers. Combined with an active operational community whose average age is now 50, global exponential demand for skilled aviation personnel and growth in fleets in Asia Pacific of around 5% pa all of this shows a fairly challenging supply problem in the years ahead. The numbers of potential new employees entering the industry appears to be dwindling. For example, next year we are predicting less than 150 pilots will commence training due to lack of funding (either student loan or private funding). Over the last 5-7 years, the industry has benefited from upwards of 300 commencing training in any one year. This has generally resulted in around 200 fixed wing and between 50-70 helicopter pilots completing basic training every year. We are not discussing here the merits or otherwise of student loan funding – that’s a discussion for another day. What we are talking about is the security of supply of appropriately qualified persons into employment in our industry. The same comments apply to our engineering people where the lead in times to qualification and thus fully productive can be between 5-7 years. Growing our people is as critical a strategic issue for the New Zealand economy as having the right number of engineering and IT graduates. We never cease to be amazed at the level of funding that goes into programmes that have very limited economic benefit. Where is industry leadership on this issue? One Industry has the development of our people as a major strategic issue. We must have alignment between regulatory training, the wider qualifications framework and the productive needs of industry. At the present time there seems to be a major void in this space. Is it the role of the ITO’s to develop integrated skills frameworks or it is the role of us working together – various governments policy setting seem to have blurred this with the present government appearing to pull away from the ITO’s having a strategic leadership role in this area. Your comments are welcome. Speaking of our ITO “the boots” were remiss to not announce the appointment of Dean Minchington click here. Dean has an extensive aviation background as well as experience in matters of strategic leadership. Clearly we are going to need some considerable assistance from the merging ITO’s to address the issues highlighted above. It is with sadness that we note the passing of Maurice McGreal click here and thanks to Mike Feeney for this wonderful recount of some of Maurice’s exploits click here in his earlier days. Maurice was 94 when he died. Our oldest industry employee still practicing is Bert Harris – Dr Herbert Harris is a professor of law and consultant based in Dunedin. Conference 2013 - we suspect aviation and a few highland flings accompanied by a haggis or two will be in our DNA. Planning is rapidly advancing as effectively we’re two months earlier in 2013 and “red boots” and the staff want to impress on you our quick turn around times. We’ve got a number of incentives in place to get you interested. If you attended Rotorua we’re rewarding you loyal members. In addition there’s a 5% discount for delegates who enroll and pay before 1 April click here. Wednesday night – Aviation week dinner at Etrusco an Italian restaurant within 3 minutes walk of our conference hotels. Thursday night – the conference gala dinner at Larnarchs Castle – buses and escorted tour around Australasia only true castle provided. Conference week has been shortened to enable delegates and families to ski the week ends before and after. We are running from mid day Monday to 1300 hours Friday. 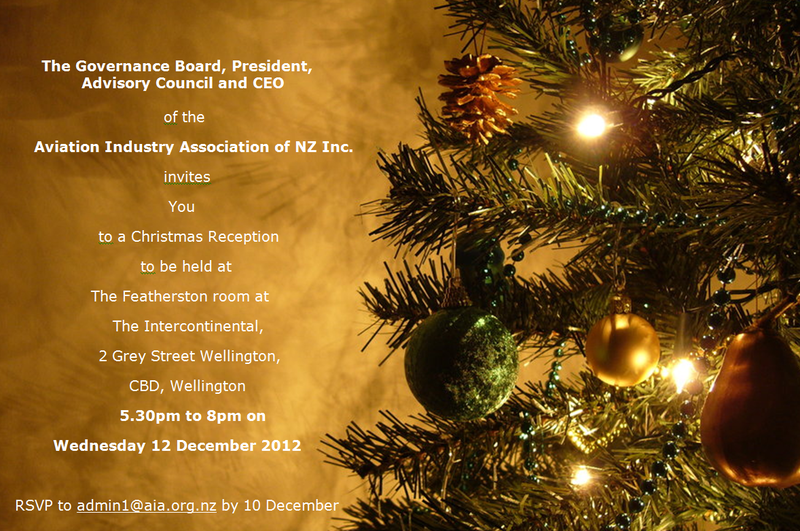 NZAAA will commence the week as usual but there’s a day overlap with the full AIA conference. We’ve already got our first bookings and from early next week we will start promoting the trade event to the wider community as a number expressed interest in Rotorua but were unable to make it at the last moment. We are also working on the speakers line up so if there are any expressions of interest please click here. Our emphasis will be on safe and profitable growth including accessing international opportunities. We hope to engage with a number of foreign delegations including from the India market at conference as well as potential off shore buyers for products on display at the trade show. The Governance Board along with the AIA Executive have been working on plans to launch a number of initiatives next year. These will commence roll out at the stakeholders function to be held at the Intercontinental on the night of 12 December. All members are invited to attend click here. AIA welcomes member participation in all of the divisional and council meetings. GSB – provides discounts for your company, employees and their family. Simply get in touch with Matthew Templar Matthew.Templar@gsb.co.nz to get individual cards supplied. Activation is simple. An example of a recent purchase from Noel Lemmings - flat screen TV at cost plus 10%. New vehicle purchase – no better deal in town on all models and all makes. One final note the Workplace Safety review deadline for comments extended from 16 to 30 November. Congratulations to Heli A1 and Aspiring Helicopters as our new accredited operators.